Beijing - Six-party talks on scrapping North Korea's nuclear weapons were set to gain momentum on Thursday after the chief US negotiator raised guarded hopes of agreement by week's end on preliminary steps toward that goal. Assistant Secretary of State Christopher Hill said US and North Korean negotiators were fleshing out plans to set in motion a joint statement from September 2005. 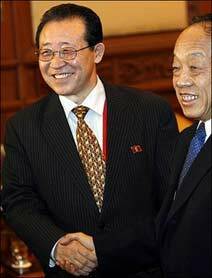 That promised North Korea aid and security assurances in return for nuclear disarmament. "Certainly we are talking about much more than just agreeing on things on paper. We're discussing actual developments on the ground, and for that reason these discussions are not easy," Hill told reporters late on Wednesday. Hill said he would be going into fresh talks with North Korea on Thursday, and an agreement could be released on Friday. His remarks were the first hint of clear progress in the talks between the United States, the two Koreas, Russia, Japan and host China that resumed on Monday after over a year's break. And they came about 10 weeks after North Korea held its first nuclear test, on October 9., drawing regional condemnation and UN sanctions. The veteran US negotiator warned differences could still scuttle a deal, particularly North Korean rancor over financial restrictions Washington invoked last year saying North Korea had counterfeited US cash and laundered illicit earnings. "Nothing is agreed unless everything is agreed," Hill said. On Monday, North Korea's chief negotiator Kim Kye-gwan laid out a sweeping set of conditions, including lifting UN sanctions and the US financial crackdown. But the North appears to have taken a more pragmatic tack in subsequent talks. Sharp disagreements remain, however, especially over the financial squeeze. A US Treasury Department negotiator said special talks on that dispute were useful but the dispute was far from settled. Those negotiations may continue in New York in January. Pyongyang and Washington also face thorny problems on the timing and order of moves, said Hill. "Really, I can't emphasize enough that we're moving toward implementation, and that means real issues on the ground, and that's always a more difficult phase," Hill said. A "new consensus" has been reached at the ongoing Six-Party Talks aimed at denuclearizing the Korean Peninsula, Foreign Minister Li Zhaoxing said on Wednesday. All parties reiterated "the implementation of the September 19 joint statement, peaceful resolution of the nuclear issue on the Korean Peninsula through dialogue, and the adherence to the common target of a nuclear-free Korean Peninsula," Li said. Negotiators are seeking to implement a joint statement in September last year, in which North Korea, also known as the Democratic People's Republic of Korea (DPRK), committed to abandon its nuclear programme in exchange for aid and security guarantees. Li made the remarks when meeting the heads of the delegations to the multilateral negotiations, which also involve the Republic of Korea (ROK), Russia and Japan. "Parties concerned should give priority to formulating plans for full implementation of the joint statement and take action to fulfil their own commitments in the joint statement," Li said, as negotiations look set to continue at least until tomorrow. By yesterday, 24 bilateral consultations were held between the six nations at the Diaoyutai State Guesthouse in Beijing as the talks which resumed after a 13-month hiatus entered the third day, according to the Foreign Ministry. The US and the DPRK continued a second day of bilateral meetings and parallel discussions on a dispute over Washington's financial sanctions against Pyongyang's companies for alleged money laundering and counterfeiting. The chief US negotiator said last night that the US side felt it "worth continuing" the discussion. "We feel it is worth continuing this discussions," Assistant Secretary of State Christopher Hill told reporters at the hotel, adding the US side was "encouraged about the progress and pleased to stay a couple of days." During a meeting with DPRK top negotiator Kim Kye-gwan on Tuesday, Hill was reported to have offered a four-stage proposal, which specifies security and other rewards the DPRK can expect if it halts the operation of its plutonium-producing nuclear reactor as a first step towards abandoning its entire weapons programme. This is the first concrete US proposal made at an official dialogue table. However, Kim was reported to have not responded directly to the proposal, repeating only his country's position that Washington should first drop financial sanctions imposed last year. The contact between the US and the DPRK for two days in a row shows "a positive sign" of improving bilateral ties, the Chinese delegation's spokeswoman, Jiang Yu, said at a media briefing yesterday. Commenting on the three days of talks, she said: "The negotiations are deepening, the focal point is becoming clear and the consensus is widening." ROK's chief envoy Chun Yung-woo said the parties initially set today as the deadline for this week's talks, but agreed to continue the session as "serious and substantial consultations" are under way. "The North's (DPRK) top priority is clearly what they call financial sanctions," Chun said, adding that "the participating nations reached a consensus that it is necessary to continue talks for a few more days rather than having a recess." Chun's comments are seen as a signal that the two main players, the US and the DPRK, were narrowing their differences on key sticking points. He did not rule out the possibility that the ongoing session will continue through the weekend.